A Template is a pre-configuration of settings of an object that could be used to configure it. The main advantage is to be able to define default values for certain objects to speed up the creation of similar objects. On creation of a Template, only the template name is mandatory. The other attributes are optional. Templates can inherit from other templates. This is a predefinition of settings at “n” levels. The object inherits from its Template which can itself inherit from its Template. If the child redefines a setting, this setting overwrites that defined in the higher level templates. Otherwise it is added to the settings. This consists of adding together several templates within the same object in order to add together all the settings available. 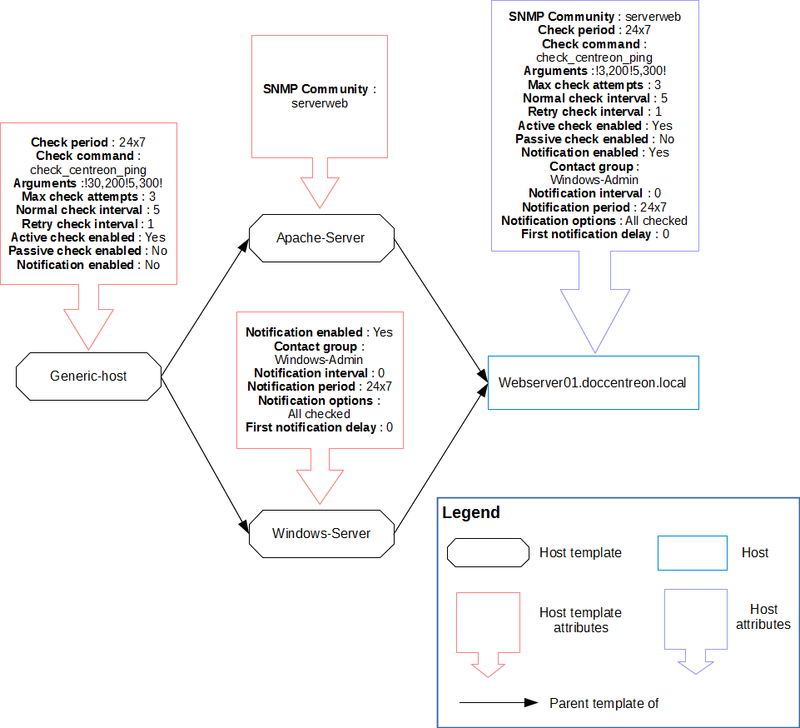 If a host inherits from several host templates and if the same setting is defined on several templates, the host templates situated above the other templates has priority in relation to its ancestors. 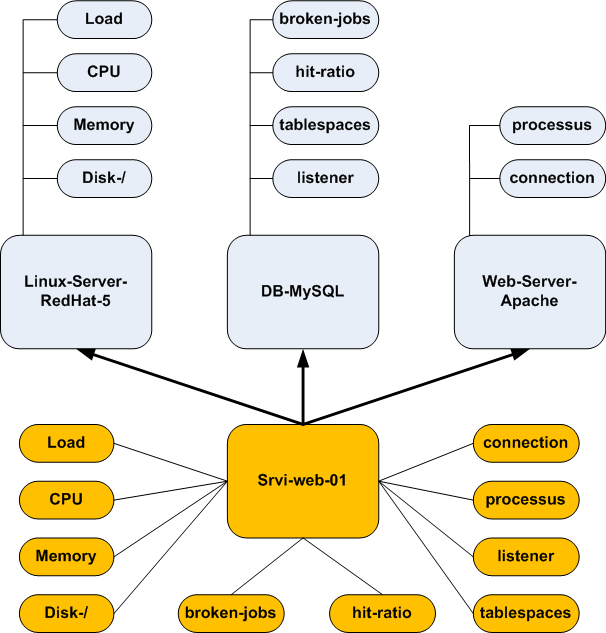 The diagram below shows a host inheriting from multiple host templates. Refer to the chapter covering configuration of hosts to configure a template because the form is identical. A service or a service template can only inherit from a single service template (parent-child type inheritance). 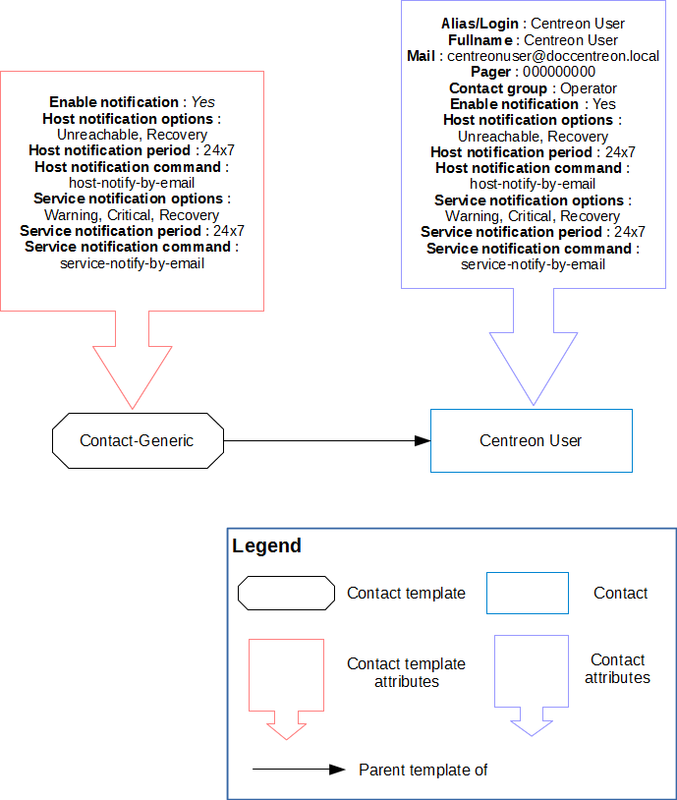 Refer to the chapter covering configuration of services to configure a template because the form is identical. When the services of a host are generated from host’s templates, it is possible that certain services generated are not checked by the supervision tool. In this case, it is necessary to disable the services that are not used (but not to delete them). In case of deletion of services, regeneration of services of the host from host’s templates will re-create the services deleted. The linking of services templates with host’s templates takes place in the Relations tab of the services templates or hosts templates. A contact or a contact template can only inherit one contact template. Refer to the chapter covering configuration of contacts. In addition, the contacts templates are used for automatic import of profiles via LDAP.